Montana became a territory in 1864, and a state in 1889. Beaverhead, Choteau, Deer Lodge, Jefferson, Lewis and Clark, Madison, and Missoula counties were established in 1865. The rest of the counties were declared thereafter, the last, Petroleum County, being established in 1925. The largest county in terms of area is Beaverhead County, encompassing 5,542 square miles. The smallest, only 718 square miles, is Silver Bow. 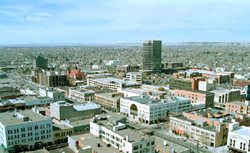 The greatest population density in the state can be found in Yellowstone County, which contains Billings, Montana's largest, most populated city. There are about 56 people per square mile in Yellowstone County. It alone has a population of 147,972 (2010) people, a little over an eighth of the total population of the state. That's a lot for one county, considering we have 56 in all! For more information, visit the Census and Economic Information Center (CEIC), the official source of census data for Montana. The CEIC has a collection of online documents about the population of the state, historical as well as current, including city and county census data. Also, check out montanakids.com's Population section, where you can find out about Montana’s largest and smallest cities. Try our License Plate Game to learn all the counties!